Physicists regularly invoke universal laws, such as those of motion and electromagnetism, to explain events. Biological and medical scientists have no such laws. How then do they acquire a reliable body of knowledge about biological organisms and human disease? One way is by repeatedly returning to, manipulating, observing, interpreting, and reinterpreting certain subjects—such as flies, mice, worms, or microbes—or, as they are known in biology, “model systems.” Across the natural and social sciences, other disciplinary fields have developed canonical examples that have played a role comparable to that of biology’s model systems, serving not only as points of reference and illustrations of general principles or values but also as sites of continued investigation and reinterpretation. 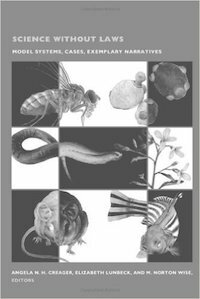 The essays in this collection assess the scope and function of model objects in domains as diverse as biology, geology, and history, attending to differences between fields as well as to epistemological commonalities. Contributors examine the role of the fruit fly Drosophila and nematode worms in biology, troops of baboons in primatology, box and digital simulations of the movement of the earth’s crust in geology, and meteorological models in climatology. They analyze the intensive study of the prisoner’s dilemma in game theory, ritual in anthropology, the individual case in psychoanalytic research, and Athenian democracy in political theory. The contributors illuminate the processes through which particular organisms, cases, materials, or narratives become foundational to their fields, and they examine how these foundational exemplars—from the fruit fly to Freud’s Dora—shape the knowledge produced within their disciplines.